What we call here the “mod karate era” ran from late 1968 to early 1973. It was a sudden break by Dennis O’Neil and Mike Sekowsky which turned Wonder Woman from unbearably campy caricature to then-modern action heroine. The “mod” part is because it was crammed with mod fashions as part of the art going more pop than before. The karate part is because the heroine was heavily trained in varied Asian martial arts. It was a stark change. While it hasn’t aged well, it has to be appreciated in the context of the previous Wonder Woman stories and the mores of the time. Because these were terrible. The “mod karate” was way more modern and relevant than what had gone on before. It was a part of O’Neil’s attempts to address major social changes (not unlike his “hard-travelling heroes” GA/GL arc). It was also daring given the stodgy and declining state of much of DC at that point. In the end it didn’t work out, and was suddenly reversed. But it was a valiant try to make a difficult character change. This profile is specific to this era. It doesn’t include material from prior or subsequent eras. So, a Language demonstrated just before this era wouldn’t be noted since it would be outside the scope of the writeup. This state of the character was essentially a reboot, anyway. Real Name: Princess Diana, aka Diana Prince. Known Relatives: Queen Hippolyta (mother). Group Affiliation: JLA (on a leave of absence). Base Of Operations: Di Prince’s Boutique, 301 Blocker Street, Lower East Side, New York City. Wonder Woman has lost the speed, strength, endurance, etc. she had as a superhuman. However, she remains an exceptional specimen, and received elite training in the martial arts. Even during her first field test of her new skills, she could demolish multiple attacking machines with ease. One haito strike proved sufficient to behead a 7’ tall robot. One karate chop from her even could shatter a stout oak plank *and* the heavy desk under it (in DC Heroes terms, Schtick (Unfettered Fist)). I-Ching started by teaching her karate – apparently the simple sportive forms then taught to Westerners. He then started covering a wide range of Japanese and Chinese techniques, including some unabashedly cinematic ones. The depowered Diana also proved strong enough to suddenly yank a heavy carpet with half a dozen people standing on it, or to rip steel chains from a wall. This is probably superhuman for a 126 lbs. person. Diana has great reflexes. She executes remarkable moves before she can even think about it – I-Ching’s tutoring was apparently based on the “reflection of the moon over a placid lake” school of thought. Diana often marvels at how this is all sheer reflex and instinct to her. Ching’s training seems to have been very broad. For instance Diana could hold her breath for much longer than normal, or pick manacles with a dirk. By early 1969, Diana procured gadgets from a criminal Irish gadgets man named Raphael. She knew him from her military intelligence days and he apparently was a contact of Steve Trevor. In particular, her earrings could be turned into Gelinite grenades powerful enough to blow a hole through a steel wall. Diana never again procures gadgets or contact Raphael, though. The former Wonder Woman can also wield an impressive range of weapons. It goes from Classical gladius and self bow, to European fencing saber, to a Type 99 machinegun. She can even build them – for instance, she had a host of black powder cannons built by a Viking-like civilisation. The Amazing Amazon also somehow knows to handle all sorts of vehicles, from boats to propeller airplanes. She can even race formula one cars, or land a private jet with a shattered cockpit and one engine shot ! Wonder Woman still speaks several languages – though this profile’s game stats only lists the ones she actually uses during this era. Amlong these, ”finger language” is something of a mystery in the story. From context is presumably a code using fingers to convey letters of the alphabet – something useful to communicate with deaf people, though less sophisticated than Ameslan or the like. Diana also has a serious case of the Attractives. Nearly every man she meets falls for her. During the 1968-69 Winter, the Amazons reached their 10,000th consecutive year on Earth. They and Paradise Island had to exile themselves into another dimension to renew their resolution and power. Queen Hippolyta urgently summoned her daughter Diana, who was unaware of the impending deadline. However, the princess chose to stay behind on Earth, cut off from her homeland, family and sisters. Steve Trevor had just been declared a traitor and was in deadly danger, and she couldn’t abandon him to follow the temporary Amazonian exile. Thus, after a quick ceremony to renounce her superhuman powers, she flew back to the US in her invisible plane. The former Wonder Woman then went to the headquarters of the Justice League to resign, but her resignation was rejected and she was granted a leave of absence instead. For the first time in her life, she had to fend for herself, starting with some source of income. Evidencing willpower, maturity and pragmatism that sharply contrasted with her recent behaviour, she decided to open a small but trendy clothing store in a less affluent area of Manhattan. As she was scouting for possible storefronts, she met an Inscrutable Oriental™ calling himself I-Ching. Mr. Ching knew who she was, and enlisted her help to prevent the evil Doctor Cyber from turning humanity into automatons. When Diana pointed out she no longer had her wondrous powers, I-Ching offered to train her in karate. He acted as her private sensei for several months of intensive training. Diana demonstrated superhuman talent at the martial arts thanks to her Amazon heritage, learning as much during those months as most people would in decades. All the while, she conducted sleuthing and legwork to locate Trevor, without success. She knows karate ! Whoah. It was Trevor who found her instead. His “treason” was a cover story designed to allow him to infiltrate Doctor Cyber’s organisation on behalf of Military Intelligence. However the mission went wrong, and Trevor barely escaped with his life. Somehow locating Diana, he collapsed in her arms with terrible gunshot wounds. Steve Trevor slipped into a coma, and died. Allying with private detective Tim Trench, Diana and Ching started taking down Doctor Cyber’s operations and evading her killers. Eventually, they invaded Cyber’s base, forcing the doctor to blow it up to escape. The trio chased her to the Swiss-like European nation of Bjorland. Again they forced Cyber to flee, although Trench left the party after accepting a fortune in gems from Cyber. With the help of a rich Englishman named Reginald Hyde-Whyte, Ching and Diana pursued Doctor Cyber to London. As they hunted her down, Diana and Reggie started falling in love. However, during the confrontation with Dr. Cyber, Hyde-Whyte revealed himself to be a Cyber agent. He refused to kill Diana and turned against Cyber. When he professed his love for Diana, the tearful ex-Amazon savagely beat him up and ran away crying, telling I-Ching that she was quitting. 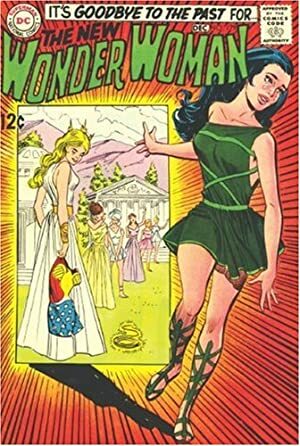 Drusilla, an Amazon messenger, then came to the former Wonder Woman with terrible news. In the dimension now hosting Paradise Island, Ares was attempting to force Hippolyta to give him the secret of transdimensional travel. Hippolyta kept refusing him, and Ares sent his troops against the Island, killing many Amazons. Ares’s daughter Eris then put Hippolyta into an enchanted sleep. The messenger took Diana and I-Ching to Paradise Island. As Diana assessed the situation and the health of her mother, Ares again demanded the secret. Urged by her mostly unconscious mother and Ching, Diana rejected his threats and led the Amazons into war. However, the situation against the beast-men army remained untenable. After thwarting an attempt at kidnapping the unconscious Hippolyta, the Amazons retreated to a mountain pass to make their last stand. Her goal was to convince them to come to the rescue of the Amazons. However the heroes were bitter, tired and convinced that all of their wars and sacrifices had been in vain. Despite Diana’s fiery speech, they mocked her and declined to help. Diana even got in a short duel with Siegfried. The duel was stopped by the Valkyrie Brunnhilde, who unlike the others chose to help Diana. She and her Valkryies arrived in the nick of time, helping repulse Ares’s troops at the pass. As the joint female armies prepared to face Ares’s troops in the plain, the armies of the god of war were hit by a formidable cavalry charge led by Roland. The male heroes, impressed by Diana’s charisma and stung by her words, had decided to fight alongside the women after all. Diana was knocked unconscious during the fray and briefly feared dead, but Paradise Island had won its freedom from Ares. Coming back to Earth, Diana ran into a gang of female slavers called Them, operating in New York City. One of their slaves, a young runaway named Cathy, had hidden in Diana Prince’s boutique. Diana beat the slavers up and expelled them from her store, thus triggering a vicious feud with Them. Diana and a concerned neighbour prevailed. After discussing the matter with the runaway’s parents, she hired Cathy as her assistant. Cathy proved to be a valuable helper at the boutique, though she and her friends ended up in trouble with Morgana the Witch, which Diana and I-Ching had to solve. Some time later, Ching was summoned to Hong Kong. Diana accompanied him. During the flight, they met Lu Shan, Ching’s long-lost daughter, who was stalked by the criminal Tiger Tong. Diana and Ching thus found themselves caught in a struggle against both Dr. Cyber and the Tiger Tong. Further, Lu Shan turned out to be an agent of Cyber. Cyber’s plan to destroy Hong Kong through earthquakes killed hundreds, but was narrowly stopped by Diana. Diana, I-Ching and pilot Patrick McGuire then helped a Chinese village near the Southern border of the PRC. The locals had been ordered to move to certain death to the North. The villagers were rescued when the trio helped them defect Southward in a paddle boat, despite the PLA’s attempts to stop them. Diana then decided to visit Paradise Island, but on her way a dimensional storm tossed her in an unnamed dimension. There, she was taken as a slave and gladiator by an evil medieval city-state, only to escape along with Ranagor, a barbarian prince. Diana led the barbarian forces in a difficult, but ultimately victorious, battle. The former Wonder Woman then returned to Earth. Back in New York City, Diana’s detection work prevented one of her neighbours, Việt Nam War veteran and likely mobster Tony Petrucci, from becoming a murderer. She discovered how Petrucci’s little sister Angela had been plunged into a coma years before, and thus staved off wrongful vengeance. Later on, Diana visited a tiny European country whose princess was her lookalike. This resulted in some confusion and embroiling her in a plot against the crown. She even was taken hostage by dangerous criminals during a snowstorm, with everyone finding refuge into an odd inn – which proved to be haunted by murderous ghosts ! Although she was no longer an active JLAer, Diana still had adventures with other super-heroes. For instance, she teamed up with Batman to stop a murderous German formula one racer and his gang of deaf thugs in Monte Carlo (!). Later, she teamed up with Superman at the behest of the last surviving computer of the year 2172. In this alternate future, Earth had be rendered lifeless. The computer determined that preventing the death of a man during a 1972 campus riot would fend off events leading to this future, and requested Diana and Superman’s help. The duo prevented a student matching the description from being killed by the National Guard. But to their shock, they then realised that a young Guardsman also matching the description had died in the conflict. Diana and Superman left, wondering whether they had been successful in forestalling the future. A short time later, Diana also helped Ching and Superman solve the case of the pseudo-Superman from Quarrm. Mere days later, another fatally wounded American agent stumbled into Di’s boutique, looking for Ching. Before he died, he warned Ching and Diana of the imminent assassination of a foreign ambassador. While Ching warned his intelligence contacts, Diana acted as an impromptu bodyguard to the ambassador, foiling 3 assassination attempts. Military intelligence soon drafted her back to continue ensuring the security of the ambassador. However, it turned out that the ambassador was a disguised assassin. The previous attempts to murder him were fakes ! Diana spotted his mask as he was about to shoot Richard Nixon . She regrettably knocked the killer out before he could pull the trigger. These exploits as a bodyguard led to her hire by Fellow Dills, the “King of Beautiful Women” – a very rich clubs owner. Dills had been targeted by a morality organisation called the Tribunal. The clubbing mongul already had hired famous private detective Jonny Double as a bodyguard. Yet he reasoned that a beautiful woman would be expected to just be an extra and not a bodyguard, and would thus mean better security. Diana at first refused as she disliked Dills’ male chauvinism. She only agreed to take the job when Dills offered to pay for surgically restoring Ching’s eyesight. Jonny Double and Diana were captured by the Tribunal, but ensured Dills’s getaway. Diana escaped, and happened upon Double as he was offering to be executed instead of Diana ; both then escaped. The Tribunal was revealed to have been a front established by Doctor Cyber to gain revenge on Diana, and Dills was her unwitting pawn. Nevertheless, Diana escaped Cyber’s deathtrap and fought her way out along with Double. Diana’s romance with Jonny Double did not go very far. While he was likeable, Diana thought he was ultimately a loser. Double soon disappeared, leaving behind a ransacked office, bloodstains and two dagger-wielding fanatical assassins. Ching identified the men as part of a hidden Tibetan cult. Soon after he and Diana received a note telling them to find the magical gem worshipped by the Tibetans, the Fist of Flame, in exchange for Double’s life. Neither Diana nor Ching had the necessary funds to fly to Tibet and back, so Diana sold her boutique to a wealthy hippie couple. Once in Tibet, Ching and Diana located the hidden valley and took out the guardian of the Fist of Flame. However, they weren’t the only one after the gem – Catwoman, freshly returned to a life of crime, had also just reached the valley. Diana got the gem first, but fell prey to its hypnotic properties. Catwoman then knocked her out… only to suffer the same fate. Both women and Ching were captured by the inhabitants of the valley. Although condemned to fight to death with swords while suspended over a burning pit, Diana and Selina got out of that situation alive. Diana defeated Catwoman by disarming her, then worked with her to escape from the pit and take out the guards. Now allied, they managed to free Ching and grab the gem. Catwoman revealed that she had been the one who had hired Double in the first place to help her locate the Fist of Flame. She also knew that the gang who had taken him captive was led by Lu Shan, I-Ching’s daughter. As they were trekking out of the valley, the three adventurers were teleported by the mystical Fist of Flame to another world — Newhon . The Fist of Flame had a sister gem, the Eye of the Ocean. A person looking through one jewel could see through the other, and both jewels would randomly take those around them to another dimension and back. Furthermore, the two jewels, once united, enabled controllable dimension travel. This latter property was coveted by two parties – Lu Shan and her gang, on Earth, and the sorcerer Gawron, on Newhon. On Newhon, Diana, I-Ching and Catwoman allied with Fahrd and the Grey Mouser, who were attempting to steal the Eye of the Ocean. Together they stormed Gawron’s fortress. During the fight Lu Shan and her gang were teleported to Newhon by the gems – along with Jonny Double. I-Ching used the two gems to create a portal, and he and his allies escaped to Earth. Fahrd and the Mouser followed, and grabbed the Eye before they left. However, upon seeing and smelling New York City, Fahrd and the Gray Mouser promptly returned to Lankhmar. Diana was then contacted by Batman to become the duenna (chaperone) of one Conchita Vasquez, a young noble from the island of San Sebastian. The situation in San Sebastian was revolutionary and explosive, and Batman wanted to have an ally monitor the Vasquez in the US. Diana, Batman and Conchita’s brother ended up foiling a counter-revolutionary plan that would have resulted in a massacre in San Sebastian. The former Wonder Woman was then convinced to attend the 100th meeting of the Justice League of America, during which an emergency occurred. The JLA was called to reinforce Earth-2’s JSA, as Earth-2 was threatened by a gigantic disembodied iron hand poised to crush it. Due to her lack of powers Diana stayed behind to coordinate, but she was attacked by Iron Hand, the mastermind behind the threat. Iron Hand soon discovered that Diana was no hostage material. She took him down and demolished his iron hand prosthesis to disarm him. However, the Iron Hand’s prosthesis also turned out to be the only thing that could take control of the gigantic disembodied hand. The Red Tornado eventually sacrificed himself to put an end to this threat. Back on Earth-1, Diana returned to more mundane problems, such as earning money. She nearly worked as a spokeswoman for Grandee’s, a stores chain, but discovered that the local women’s lib group accused the manager of the chain of wrongdoing. Diana ended up siding with them and exposing Grandee’s misdeeds. Events then took an abrupt turn. Ching was killed in a random sniper attack, and Diana knocked out and made amnesiac when she took down the killer. Fleeing the hospital, Diana instinctively went to Paradise Island, where she recovered her memories, costume, and powers. The era of Diana Prince, mod girl about town and karate master, had come to a sudden end. A post-Crisis karate mod era ? The vaguest, but most recurrent, are white emmapeelers being shown when a panel includes a retrospective of Diana’s costumes. Furthermore, in the late 2000s, a post-Crisis version of I-Ching appeared – though so far no connection with Diana has been mentioned. The timeline for Wonder Woman has also changed with Infinite Crisis. Post-Crisis on the Infinite Earths, Wonder Woman arrives on Patriarch’s World when the leading heroes, such as Batman and Superman, are already well-established. After Infinite Crisis, her debut is contemporary to Batman’s and Superman’s. How this impacts her biography is unclear. But it opens a shadowy time span where numerous adventures could have occurred. One guesses that pre-Crisis material occurred during this era. This is especially given the “everything is canon, though it probably was even cooler than what you read back then” paradigm from Grant Morrison on Batman and its impact on the DC Universe. 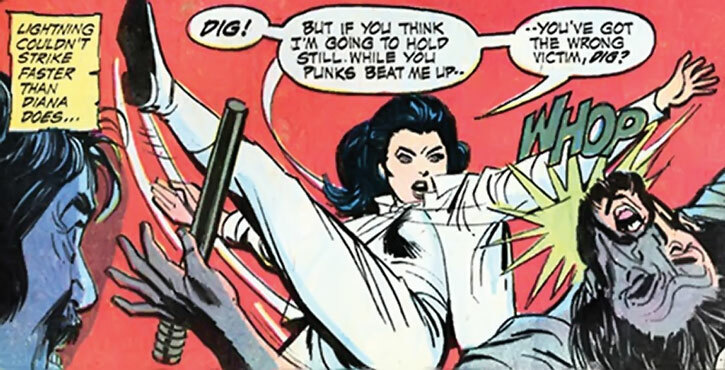 A 2006 panel where Nemesis shows a photo of a woman looking like Princess Diana, in a white jumpsuit, fighting alongside I-Ching. This photo was taken some months after the death of Max Lord at Wonder Woman’s hands, and thus during the “One Year Gap”. Also in 2006, the retrospective opening the new run of JLA clearly shows a version of the Iron Hand incident and the sacrifice of Red Tornado. Though the specifics were necessarily different (it can’t have been a team-up between Earth-1 JLA and Earth-2 JSA), Diana is wearing the same clothes as she did in the pre-Crisis depiction, and appears unpowered. An educated guess — that is, a series of unsupported hypotheses — would thus be that something akin to the karate mod era happened (only even cooler) early in WW’s career, and I-Ching didn’t die at the end. Both Diana and Batman kept in touch with I-Ching. After Circe gave Diana a depowered human form, WW went to train and adventure again with her old sensei for a short while to make sure she could operate proficiently in human form. The old Diana Prince identity was used as a base by Batman, Superman and Wonder Woman to design the new Diana Prince identity when she took a sabbatical from being Wonder Woman. The all-new, all-different Diana initially wears a wide variety of fabulous, colourful late 1960s mod outfits – think glam Woodstock. Diana often wore 1970s-style white minidresses, which — for those readers who weren’t around — were *really* short. Diana wearing an all-white outfit (particularly catsuits akin to the fashion Avengers heroine Emma Peel would wear) has become the accepted shorthand for this era. In actuality, it occurs somewhat late in the stories. See the innumerable illustrations for this entry for an idea of what she also wore. Amusingly, the schtick of wearing white clothing was something of a live retcon. Several issues during the run were reprints of issues published about a year before, and in those the colouring has been changed to have Diana wear white. Diana is still an emotional, passionate woman, deeply motivated by doing good deeds and defending her friends. However, she’s now independent, competent, resourceful and strong-willed. While these latter characteristics should be understood in a very dated 1960s context, the contrast with her previous behaviour is flabbergasting. At first, she was uneasy with the power of her human emotions — apparently magnified by her depowering — but she overcame that. Although she prefers to behave in a feminine and romantic way (she’ll occasionally act girly for no discernible reason), Diana can get brutal if need be. She threatened to twist and break the ankle of one of Cyber’s agents to make her talk, and later started a fight with a headbutt to the nose any soccer hooligan could have been proud of. Those spurts of violence are quite notable given the acceptable behaviour for females back then. Diana is all about Upholding Good, but during that era her focus on peace is not as clear as that of the post-Crisis Wonder Woman. Rather, she is an unlikely cross between an adventuress, an amateur sleuth, a paladin and a girly girl. Although she acts to prevent murder if at all possible, she will kill in time of war. Diana loves being romantic and is quite partial toward handsome, strong men. She’s quite open about dating nice hunks she just met. Of course, events always interrupt the flow of things at the dating stage. Sealed system is a Skilled Power. Attractive, Familiarity (Fashion and style), Language (Ancient Greek, Spanish, finger language), Lightning Reflexes, Sharp Eye, Schtick (Unfettered fist). I-Ching (High), Police agencies in the free world (Low), Paradise Island (High), JLA (High), Johnny Double (Low). GRAPPLING HOOK BRACELET [BODY 06, Misc. : Has a 3 APs long line attached. This is a grappling hook disguised as wrist jewelry]. Explosive earrings (x2) [BODY 03, EV 09 (Area of effect 1 AP), Grenade Drawback]. Acid-loaded buttons (x2) [BODY 04, Acid : 08, Limitation : Acid has No Range, Acid has Power Loss (EV is 05 against non-metals, 00 against glass), Grenade Drawback (except it cannot even be thrown – it has to be snapped open above the target)]. Charisma is there for those people with house rules about Unskilled Character Interaction. Source of Character: Wonder Woman issues in 1968-72, taking place on pre-Crisis Earth-1. Helper(s): Darci, Peter Piispanen. For the “A post-Crisis karate mod era ?” section, CBR forums contributors BnL and Carol Strickland. Carol also wrote a Fanzing article about this Wonder Woman era, which complements this article quite well.